The University of Belgrade Faculty of Law is one of the top law schools in the region of Southeastern Europe and posseses a record of academic excellence and international scholarly influence. The Faculty of Law was the fouding member of the University of Belgrade in 1808, originally formed as the Higher School, offering legal education with a curriculum similar to the Habsburg Royal Academies of that time. Since 1841 it has been continually evolving in accord with the European academic model and standards, acquiring an excellent reputation due to its educational, scholarly, and research mission and its many achievements. Over 45.000 students have graduated from the Faculty of Law in Belgrade since the end of World War II, and more than 1.500 students have earned their LLM degrees, in addiiton to approximately 950 candidates who have obtained their doctoral degrees. The University of Belgrade Faculty of Law continually modernises its curriculum, introducing new technologies, thus contemporising the learning facilities and enriching its highly qualified academic staff, which now encompasses over 110 professors and lecturers. Combining its traditional values with the needs of the modern era as well as the demanding standards of the European Higher Education Area, the Faculty of Law has continued to strengthen its integrity, reputation, competitiveness and development capacities. The majority of the teaching staff is represented by young associates, a large number of whom have graduated from renowned international academic institutions. The University of Belgrade Faculty of Law favors the accession of Serbia to the European Union. Respecting both national and European values, it strongly supports the mobility of its students and academic staff. For these reasons, the University of Belgrade Faculty of Law aspires to provide excellence and competitiveness in legal education. We rely on a broad curriculum, and our credo is that a proper legal education encompasses not only profound knowledge of legal issues, but that it also must include a broad intellectual approach. The Faculty of Law offers this through required and elective courses in economics, legal philosophy, legal sociology, legal history, and other academic pursuits, combined with the development of practical skills by teaching students diverse and integrative skills, and by offering opportunities to improve those skills through a variety of moot court competitions, legal clinics, legal writing, etc. Currently the University of Belgrade and its Faculty of Law are ranked among the top 201-300 universities according to the Shanghai Academic Ranking of World Universities and we continue to develop an internationally-oriented approach to the teaching of law. This commitment allows the Faculty of Law to attract students from different countries through the Erasmus+ program and other programs of international exchange. In addition foreign students often enroll at our Masters Program in European Integrations which is entirely taught in English language. Furthermore, in cooperation with the Centre Européen Universitaire de Nancy – Université de Lorraine, it offers a French-language degree – Le Master «Etudes Européennes», 2e année, spécialité «Droit de la Construction européenne». 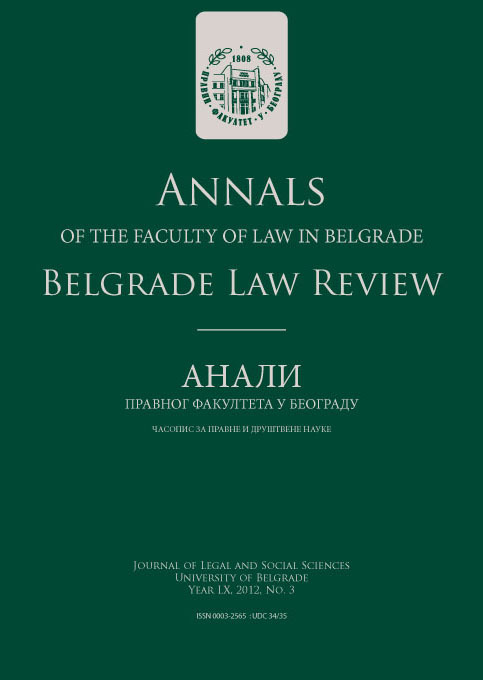 Relying on the tradition which had secured its prestigious position, the University of Belgrade Faculty of Law strives to maintain its progressive and integrative approach for the welfare of Serbia and the entire legal-academic community.